iOS 7 was released to the public today and I am thrilled to finally have iOS 7 on my everyday iPhone. I've been using iOS 7 betas on an iPod Touch for testing since the first iOS 7 beta release on June 10, 2013. And on my everyday iPad (one I use everyday) since iOS 7 Beta 2 was released with support for the iPad on June 24, 2013. 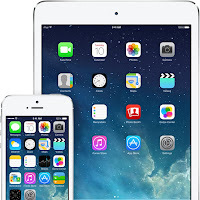 Check out all the iOS 7 blog articles here. But, I didn't want to mess with my everyday production iPhone that my life depends on. So I waited until today's public release to upgrade, and I'm THRILLED !!!! Finally, iOS 7 on my phone. So, don't be afraid. Upgrade.... Based on my experience with iOS 7 over the last few months, I can recommend it. Apple's Sept 10th Event: What's coming ?